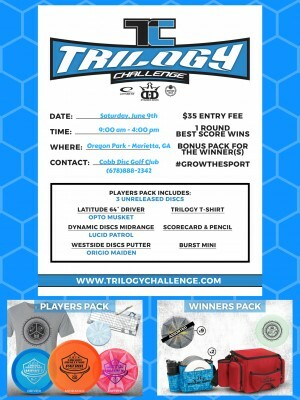 The idea behind the Trilogy Challenge is to grow the sport of disc golf by providing beginners with everything they need to play. The Cobb Disc Golf Club has hosted a Trilogy Challenge at Oregon Park every spring since 2014. The event sees both new and experienced players come out and enjoy a day of disc golf at the park. At an event geared toward beginners, our goal has been to give everyone a chance to win, no matter their skill level. In addition to the winner packs that are awarded for the best round, every player will receive a free entry into a drawing for a prize of nearly equal value. You can win by being good and you can win by getting lucky! Cobb Disc Golf Club is responsible for all refunds/cancelations.